A 2013 Accord Sedan became the one millionth Honda vehicle exported from the United States when it boarded a ship at the Port of Port Hueneme earlier this month. The vehicle departed on a nearly 6,000-mile journey across the Pacific Ocean to Seoul, South Korea, on Dec. 12. The milestone came 25 years after the first US-made Honda automobile was exported overseas. The millionth Honda US export vehicle, a silver Accord EX-L Sedan, rolled off the assembly line in Marysville, Ohio on Dec. 5, 2012 and was then transported to Port Hueneme in Ventura County, California for export overseas. Honda currently exports automobiles to more than 40 countries from the US through seven port facilities in five states. The Port Hueneme facility, which Honda has been using for six years, is the company’s only one on the West Coast. Honda currently exports automobiles to 49 countries outside North America, with total exports expected to reach nearly 100,000 Honda and Acura vehicles from the US by the end of 2012. The company says that within two years, it will export more vehicles built in its auto plants in North America than it imports from Japan. By 2014, the company says, it’s expected to increase automobile production capacity in North America from the current 1.63 million to 1.92 million units per year. In coming years, the car company says, annual exports of Honda and Acura automobiles from the US are expected to surpass the company’s previous single-year export record of 105,511 vehicles, which was set in 1994. The Port of Seattle Commission has announced the outlines of the process and the timing for identifying and appointing a successor to fill the vacancy on the Commission that will be created when Commissioner Gael Tarleton resigns from the Commission Jan. 31, 2013. Tarleton is resigning because on Nov. 6 she was elected to represent the 36th legislative district in the Washington State House of Representatives. Under state law, the Commission will have 90 days to appoint a successor, with the decision made by majority vote at a Commission meeting. Tarleton’s successor will serve until the November 2013 general election when a candidate will be publicly elected to complete her term, which expires Dec. 31, 2015. The process and proposed schedule announced by the Commission includes a Jan. 10, 2013 issuance of a notice of the vacancy. From this date, applicants will have 15 business days, excluding holidays, to submit their application materials to the Commission. A town hall-style meeting at Seattle-Tacoma International Airport for interested individuals to ask questions about the appointment process will then be held Jan. 22, followed by a Feb. 1 deadline for applications, which then launches a 90-day window for a successor to be appointed. More information on the selection process is available as a PDF on the port’s website, and application materials can also be found on the site. Port of Vancouver USA Commissioner Jerry Oliver will serve as president of the Washington Public Ports Association (WPPA) Board of Trustees for 2013. The WPPA, which promotes the interests of public ports through government relations and advocacy programs, was formed by the Washington State Legislature in 1961. Oliver was elected president on November 30 at the association’s annual membership meeting in Seattle, Washington. “As a true believer that the Port of Vancouver plays a critical role in the economic well-being of my own community, I am honored to serve on the board of an organization that promotes the value of public ports throughout our state,” he said. Oliver, who was elected to the Port of Vancouver Board of Commissioners in 2007, has been a member of the WPPA board for three years. He’s also the incoming president of the Port of Vancouver’s three-member Commission. His current six-year term on the board expires at the end of 2013. Oliver holds a bachelor’s degree in economics from the University of Michigan. His career includes 20 years in the medical products distribution business as well as seven years in the financial brokerage business, according to the Port of Vancouver. Oliver also was self-employed for eight years when he worked in mid-market mergers and acquisitions. He retired from business in 2008. The Port of Los Angeles has won 10 communications awards in an annual competition hosted by the American Association of Port Authorities. The port’s 2011 Waterfront Summer Concert Series won top honors in the “excellence” category, and nine other programs – including the port’s “LAtitude” video e-news magazine, LA Waterfront Public Outreach Program and its School Boat Tour Program – were also recognized in various categories. The AAPA is an alliance of more than 140 ports in the Western Hemisphere. AAPA Award entries are judged each year by transportation industry PR practitioners who are members of the Public Relations Society of America National Chapter in Washington DC. 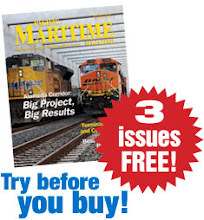 LAtitude, the port’s e-news magazine; TradeConnect, a business and legislative outreach program that assists small and medium-sized businesses in establishing or increasing their importing and exporting potential; and the School Boat Tour Program, a free, educational boat tour program for fifth and sixth graders within the Los Angeles Unified School District. Also recognized by the AAPA was the port’s Mariner’s Guide, pocket-sized handbook that provides tidal information for persons who pilot or operate ships and small boats in and around the port; the Portfolio TV show, a quarterly half-hour program that focuses on informing local audiences about port operations, community events, environmental developments and infrastructure projects, among other issues. It airs on regional cable TV networks.